Johnson Pump products are widely used to transport all types of liquids including clean, aggressive, thin or highly viscous products. The Johnson Pump brand includes centrifugal, positive displacement, lobe, gear, impeller and air operate double diaphragm (AODD) pumps. Its Combi-system provides modular solutions using common components shared across different models of centrifugal pumps. SPX says the reliability, modularity and flexible design options offered by these pumps ensure high performance with low installation and ongoing maintenance costs. Johnson Pump products are widely used to transport all types of liquids including clean, aggressive, thin or highly viscous products. They handle fluids as varied as pharmaceutical syrups, resins, oil sludge and chemical acids. Supporting its pumps, it also offers a range of filters for pump protection from debris down to 10 microns. 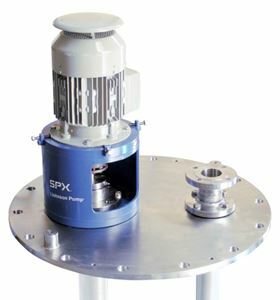 SPX Flow says its APV brand is synonymous with hygienic design and quality in industries including food, beverage, chemical, healthcare and pharmaceutical. It offers a wide range of energy efficient pumps and valves that are designed to ensure reliable operation and high efficiency, according to the company. Hygienic solutions include pumps and valves that are well suited for clean-in-place (CIP) and sterilize-in-place (SIP) duties as well as EHEDG and 3A approvals.